In the automotive aftermarket, customization is the name of the game. That’s why LINE-X® is available in a full spectrum of color options. Whether it’s coded to match your vehicle or your favorite color, LINE-X products can be customized for an even more personalized look. Starting with a sample of the color code, LINE-X technicians can pigment any of our high-performance coatings to your liking, whether it’s a silver truck bed or a candy-apple red rocker panel. 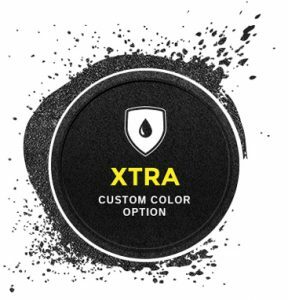 Color options allow you to create a custom look for your truck with the added confidence of LINE-X protection. LINE-X XTRA provides additional protection against scratches, gouges, and punctures. Ultraviolet-light radiation can affect the appearance and color of your bedliner. Like a sunscreen, LINE-X XTRA helps minimize UV damage. LINE-X XTRA provides a long-lasting rich gloss that gives your truck bed that just-sprayed look. LINE-X XTRA permanently bonds to your LINE-X bedliner, creating a seamless topcoat of color and added protection. © 2016 EXTREME™ AUTO DESIGN. All rights reserved. Design by DON.